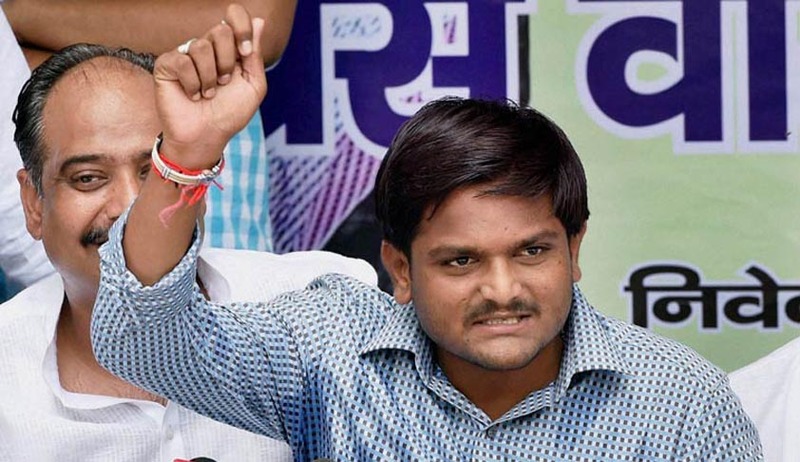 The Gujarat High Court has granted Bail to Hardik Patel on the main condition that he shall file a fresh notarized undertaking before the Trial Court within a period of two days from the date of his release on the same line as filed before High Court and shall also declare that he is ready and willing to remain outside the territorial limits of State of Gujarat for a period of six months from the date of his release. A) That the applicant is behind bar since October, 2015 i.e. more than 8 months. Investigation is over in each case long back and charge-sheets have been filed in the month of January, 2016. B) The applicant has filed an undertaking in both the cases on the same terms like other accused, who have been enlarged on bail, namely, Dinesh Bhagvanji Patel (Bambhaniya), Ketan Lalitbhai Patel and Chirag Bharatbhai Patel who have been released by Court on filing undertakings before the Court and State has not opposed grant of their bail applications. These accused are members of PAAS since its formation. C) That the applicant has shown his readiness and willingness to remain outside State of Gujarat for a period of six months from the date of his release, wherein such readiness and willingness has not been shown by any other accused who have been enlarged on bail asking them to remain out of a particular District. D) That peace is prevailing in the entire State of Gujarat since long. Destruction of Public and Private Properties, in Re. v. State of Andhra Pradesh and others, (2009) 5 SCC 212. F) There are no possibilities that the trial would be completed in short time since the offence registered with Amroli Police Station, District Surat is concerned, there are 148 witnesses and as far as the offence registered with DCB Police Station, Ahmedabad is concerned, there are 503 witnesses. "That the applicant, if granted discretionary reliefs, shall continue to agitate the grievances of the Patidar Community without indulging directly or indirectly into any activity which may amount to an offence inviting criminal prosecution. That the applicant, if granted discretionary reliefs, shall not do or indulge in any acts or activities disturbing the law and order across the State. That the applicant, if granted discretionary reliefs, shall continue the agitation for reservation on behalf of the Patidar community in a peaceful and democratic manner and shall not indulge in any acts or activities instigating the public at large in any manner whatsoever and shall also maintain public peace. That the applicant, if granted discretionary reliefs, shall abide by all the conditions imposed by Court and shall not breach any of such conditions as may be imposed by the Court." As far as the apprehension put forward by the Public Prosecutor that if the applicant is released on bail and even if he is ready and willing to remain outside State of Gujarat for a period of six months, there are possibilities of repeating the offence is concerned, the Court said that there is no material put forward by the Investigating Agency that even if the applicant remains outside the limits of the State of Gujarat, he shall continue the same activities. [g] responsible Police Officer shall take appropriate steps to see that the applicant reaches safely to the place where he is going to stay for a period of six months. This exercise shall be undertaken within a period of two days from the date of his release. According to NDTV Report, though Mr Patel was given bail in two cases, he is in jail for another case of. If he gets bail on Monday in that case, he will be free after nine months in prison.